I have been waiting forever for an update. The game is amazing but it has been two years since the last update, I understand that they are working on console and PC but please update it! Ok I got this for my birthday and there was nothing wrong with it but the controls are kind of weird but that's ok because I got used to it, also make sure to do the tutorial. I didn't and it was very hard to play but even with out the tutorial I still learned in like... 2 minutes and it DOES SAVE YOUR PROGRESS!!! terraria always has my attention. it is very fun and it doesn’t get boring. it’s an amazing game and i’ve been play it for years but the game hasn’t been updated in 2 years and you guys lost a lot of players including myself for a while, please update! 1.3 would be great maybe more people would get it right now it’s just a waste of money. I have watched way too many young kids in my town lay this game, thinking it was a fun game but then dropping the game when something that looks like the devil (voodoo demon) attacks them. I like this game but there needs to be a more child friendly version. I have recently had trouble picking up bugs and animals with the bug net. Yes, this isn’t a VERY big deal but me and my brother were trying to make a bug/animal room but we weren’t able to because we couldn’t pick up the animals. Great game though! The loading time is slow for servers. Existed for 1.3 Wish I had free bata!?!? I CANT PLAY IT BECAUSE THE SAFE ZONE DOSENT FIT MY PHONE AND THIS GAME HASENT BEEN UPDATED IN 2 FREAKING YEARS AND ALSO PLEASE ADD NEW CONTENT. Both of my characters are gone and each time I try to log in it glitches the music and logs me out the app and I can’t play it anymore, it’s probably my iPad or the game. And can you add yo-yos if you can. Good but needs an update for mobile.. This game is so awesome I been playing this game with my brother for years since it came out but there is two things that keeps bothering me. The first is saving data. Every single time I try and get back to play this awesome game, I can’t find my character that pacifically saved in cloud save and It takes like 30 minutes of me deleting it and reinstalling to get my cloud save character back but the game is still amazing and another thing is updates. This game just needs a little more updates at least every 3 to 5 months. Thank you for this awesome game and I wish this company has an awesome future! Thank you! I can’t explain it in any other words. It’s. Just. GREAT! Yes... just yes! This is the best mobile game. I love it so much. Please release update to 1.3 PLEASE!!!!!!!!!!!!!!!!! I love this game because it have different type of play styles and so many weapons to collect but it would be way more fun if 1.3 came and we don’t even know when it gonna happened I hope soon but overall AWESOME GAME. The game is so fun. But eventually there is only so much you can do. I have been waiting for 1.3 but it hasn’t come out. Recently I hopped on to the game and my character didn’t save and I have so much time on it 400-700+ hours. Honestly I’m not mad I’m sad, I have spent so much time on this game and nothing saved. First, I really like Terraria, this mobile edition was the first time getting it. All I have is two questions. 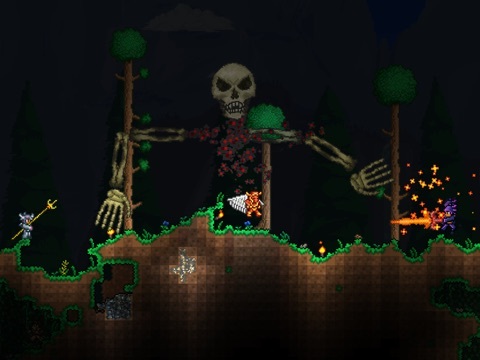 -Is there a set release date for 1.3 features for mobile Terraria? -When will that Everyplay SDK “Build has expired, plz upgrade” message go away, while it doesn’t cause any problems, it is a bit annoying to have to click though it every time I play Terraria? I hope my questions are answered in a developer response. The rest of the game is fine but we’re is creative mode, I’m trying to look for it but it’s gone, pls add creative mode. Hey terraria developers or whoever reads these comments! 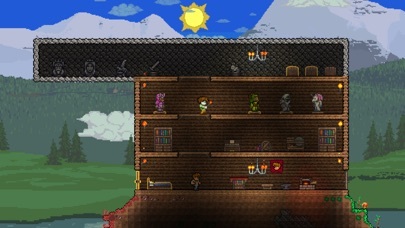 I love terraria and I think it is great. I have been playing it on my phone for a while and there’s no way I’m downloading it on my computer because I don’t have steam or anything and my computer is really slow. Anyways, to get to the point, I want to be able to host a multiplayer game with my friends without having to be on the same WiFi. I don’t know how that works on the computer but it would really be great to have that on mobile. I also really think that you should add lunatic cultist and moon lord and stuff on mobile because for some reason you just don’t have the final boss in it. That’s all and I hope this comment doesn’t sound long-winded and pretentious to all the people who might read it. This game is the best in the world! But great things aren’t always perfect. When I try to spawn the golem in the temple with the cell it always says that I need to use a cell. Please fix it I really want to be able to kill it and get the picsaw. The glitches are ruining the game some are small like the fisherman sliding across the floor and some are huge like making it crash when I open a certain world (which happened to my main world and my replacement main world on my phone and on a mini iPad). Please fix this. The cover is still thanksgiving and what is my “everyday SDK” that it keeps saying is expired. Fix it please. I payed money for this game, and I want it to be worth it, because right now all it does is piss me off. Please consider adding some kind of far distance multiplayer or something of that sort, other than that, the game is amazing. I love this game and it’s monsters but it’s a problem when I light up my house with torches and I still find slimes and demon eyes in my basement! Please fix this! This is a great game. But my question is when are you going to add moon lord to mobile. That would make the game way more fun for people who don’t have a PC. Hey not to be mean but when are you going to release the 1.3 update for mobile I am starting to get bored just fighting the same bosses and would like to have the Lunatic Cultist, the celestial pillars and the moon lord. When you are ready to release the date of the 1.3 update please do so. PS I am enjoying your game. You need to update the game to 1.3 at least by the end of the month come on 505 we need this!!! I loved this game since the beginning! All the memories playing this game came to me when I saw it. One problem I HAD is I’ve lost my progress 3 times while having beetle armor with terra blade. Also, where’s 1.3? This is the best thing since sliced bread!!! Thank you so, so, soooo much ReLogic! This game is fabulous! One recommendation, why don’t you add lunatic cultist, lunar events, moon boi, and the meowmere. One of my favorite mobile games! The developers of terraria mobile have really outdone themselves creating a mobile version of terraria that’s nearly identical to how it is on other platforms. I’ve been having SO much fun with this game and I can’t WAIT to see what’s added in future updates! I love Terraria a lot and have played it a lot but when one of my friends tried to download it we realized it had updated into a port for Terraria on stronger devices (anything but mobile) which really sucked since we really loved it and I was wondering if mobile Terraria could become a port and it’s old self if it’s possible if it does happen I will bring the rating up to 5. This game was amazing on my iPhone 8, but now I have the iPhone X and the screen isn’t optimized for it. Please update the app for it to be X screen friendly!!!! As fun as this game is and as much as it generally deserves a decent rating, a poor choice by the developers has repeatedly led to frustration and even tears from their players. My family members have lost everything multiple times now due the way the local game file are prevented from being backed up and restored when moving between devices either for an upgrade or hardware replacement. The system that should be protecting the hours of work put into the game automatically is replaced by a limited manual process that is easy to forget and a pain to actively manage. This would be a great world/character management addition to standard iOS backups, but a poor substitute. Please fix the game data to allow iOS backup and restore to function correctly. I used to really like this game. But when I tried to boot it up on my new XR, the black bars on the sides just ruin it for me, as I have to reach for the controls. The game would look fantastic if it reached the edges of the screen, giving more space for the player to be emerged in the game. If the developers fix this problem, I’ll be satisfied. Id say this is a good game just that Theres this glitch Where i have a Spear and i use it then when i use it for about 20 seconds and then it goes off my hands and Stands until the time of attack is over. Please fix this glitch. So when I play in my world for some odd reason when I go in it will crash my game. It only happens on that on specific world though. So I would like to have it fixed. I hope 1.3 will be released soon. Keep up the good work! I love this game a lot but it’s really buggy. I stopped playing a year or something ago and I just got it again and the game hasn’t been updated since. There was still the same glitches and problem and they desperately need to get fixed. Dear developers when will you ever get a chance to update the Mobile terraria to 1.3 because the last update I ever had was two years ago. Like most people say terraria mobile only has some things that the pc has. I really wish that you can start this update because I always thought that they will update this game but it’s been four years since I played this game and their were no updates. By 2020 if their is a update that will be awesome and I would play terraria everyday. And if you read this note thanks for understanding and taking your time to read this reviews. Just update terraria plz plz plz its has been so long and I want better stuff!!!! It’s a good game but mobile controls are quite bad. Always when I’m surrounded by monsters instead of moving and swinging my sword it just decides to zoom in and out of the map. Whenever I want to place something it sits there and does nothing until a enemy comes then I have to kill it and it takes a couple tries to just have a platform up. Only spent an hour on this game so far and i dont know if I want to confuse playing it. It’s very stressful and the controls need to be worked on. I love this game so much. I always played with my friends on our world we built after we got off of school back when it first came out on xbox 360. It has a very nostalgic feel and with the newer updates it just keeps getting better. I love playing this game it’s really fun.But I want more bosses that are on pc and console.Like Lunatic Cultist,Moon Lord,Dark Mage,Flying Dutchman,Orge,Betsy,Martian Saucer,And Celestial Pillars.I would also like all the weapons,guns,bows,lasers,and other weapons from pc,3ds,and console put on iOS iPad.Pls.And don’t forget all the other items from pc,3ds,and console to be put on iOS iPad pls.I need the cool stuff from Pc and console please.Terraria needs an update. It’s been 2y since your last update and there are a lot of bugs and I’m still waiting for 1.3 btw. This game is super fun and all but PLEASE UPDATE IT. 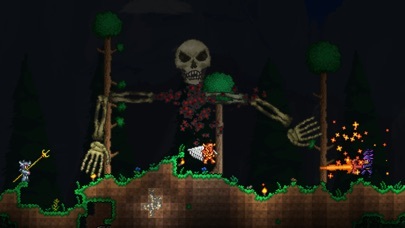 Terraria mobile is a really good game and i love it, but there is a big spawning problem, mobs are able to spawn even inside of my buildings, and for example: in the skeleton dungeon the spawn is exaggerated. Millions and millions of enemies coming at the same time, obviously I died, i couldn’t even regenerate my hp. Seriously, i love this game, but the spawning problem is huge. I played the pc version and the spawn is not as much as mobile version. I can understand this in the invasions, we have to see a lot of enemies coming for us at the same time, but the whole game is not an invasion. Please fix that problem. I love this game and that’s because i give 4 stars to this game. Terraria on mobile is amazing but can you give us some feedback on when the update will happen? I'm keeping my previous review bc I still have those opinions and complaints. Now, I have some new complaints. I'm freaking out! I keep getting kicked off of my main world!! I can go onto all my other worlds but my main world is glitched! It's been perfectly fine for weeks; this just started happening today. I even tried closing out of the game and doing a hard reset on my iPad and it still won't work! I'm seriously freaking out right now! All my stuff is on my main world and I have got loads of end-game stuff on there! It took me forever to get that stuff! I can't even go on the world if I back it up (I can't go on the back up world)! I've even tried going on the back-up world (cloud save) on a different device and it still kicks me off the game! PLEASE HELP!! 🙏😰 ***Still doesn’t work after recent bug fixes! *** PREVIOUS REVIEW: I absolutely LOVE this game!!!!!!!!!!! I do, however, have some complaints. My complaints are: 1) The music box is glitched; if I leave a world and then re-enter it, the music box disappears from my inventory and it also doesn't seem to record any songs. 2) I cannot craft lavafall & waterfall blocks even when standing in front of a crystal ball. 3) flame dye doesn't work. Other than these problems, this is a fantastic game! Lots of things to discover and craft! Love it! 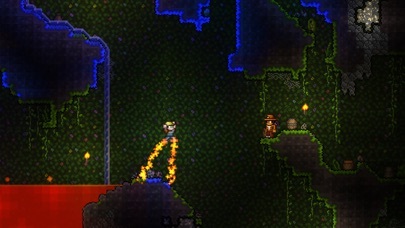 I was so excited to play terraria and do new things I haven't done like get the blizzard staff. When I started terraria everything was normal when I pressed play it says that my player file was deleted because it was made in a newer version. But the thing is I'm pretty sure that I created that character before the current version. 😭😭😭 please fix this, this is my favorite game ever. This is now one month later after this happened and so far only one other game had something like this glitch except it was in a tower defense game. That game was pvz. I'm still kinda mad about losing my progress in this game but I'm kinda happy cause now I have a new character to focus on a new way to play but still I want my character back. 8 months later now that I literally made a meme with my friends about it and I’ve been over this whole thing the day after the previous paragraph also Me and my friend are so excited for 1.3 because of the Moon Lord, the pillars, and forgot his name but the other boss. What I’m most ready for is the hopeful speed up buying stuff like musket balls and the infinite musket and arrow pouches. I remember when I first got this game, I freaked out when I killed my first boss 😂. I've came back to this game about a year later and I forgot about it. I was done with the game, because the moon Lord wasn't added yet and you guys haven't updated this in a while. I love this game, this has been one of my favorite games on the app store. I've played this game for a long time, so I have things pretty leveled up (master ninja gear, spectre armor, Terra blade, and attempting to get the last accessories for the ankh charm). I have put a lot of time into this game, and I have enjoyed every second (besides when they updated it and I couldn't get the angler and the temple in my first world). But, if you ever do update this game, I would add the Moon Lord, make a way so the accessories don't appear on your avatar when all the social/vanity slots are filled, and make chlorophyte easier to farm. If anyone is looking back at this game, don't let the 2d fool you, this game is AWESOME and has LOTS of gameplay!!!!! This app has always been my favorite. There should be more games like this on the app store! I rarely enjoy mobile games to this content, but this has been my favorite so far. If you can’t get in than turn your iPad all the way off it works thanks to my brother. I think you should add a zoo because if it is night time all the animals in the zoo should escape and you have to kill them. There should also be a panda boss. If you kill 10 pandas then the panda god awakens and you have to kill him. If you kill 20 pandas then the Qinling panda boss awakens. Search up Qinling panda if you don’t know what it is 😉. And there should be a pet griffin IF you kill the griffin boss. How do you do that? Well I think that if you get 10 feathers then the griffin boss awakens. And can you please call the griffin boss Butch. It’s a name of a horse that I love. (We are friends even though Butch is a horse and I’m a person.) by the way can you have a zoo on every world. Please. Also please get the moon lord back because I want to kill him because I never saw me before. There should be horses that you could ride too. Can you add wolfs please. (because one of my friends from 1 grade loved wolfs and she was always getting bullied and I wanted to help her but I couldn’t because she wasn’t with me when I was on the bus. She moved to a different state.) please read this when you see this!!! I've been playing this game for around 3 years and I've never witnessed this bad of a glitch. Don't take this the wrong way, I love the game, but there is a glitch that ticks me off so much. I was playing the game on one of my best worlds and suddenly my game crashed. I wasn't mad about it, because that kind of thing only happened occasionally. So I logged back into the game and tried to go back on to that world. To my surprise, that world/ file had gone corrupt. Now I know you can back up the worlds onto your cloud save, but it is to much of a pain every single time you do or create something new to exit out of the game and create a knew cloud save. This glitch has happened to me 2 or 3 times and I'm extremely disappointed and fed up with it. 505 Games, if you are reading this, if I am going to have to deal with this glitch that takes away my worlds that I put my precious time into, I want my $8 back, and want you to fix this glitch. Even if this means you make cloud saves auto save your changes in your local worlds or you entirely stop game crashes, which is highly unlikely. Even if you don't listen to this review I'd rather try to get this across to you, 505 Games, or current players so they can protect themselves from this dangerous glitch. FYI happening on an IPhone 6s. Disappointed and Angry! Good game Depends on who you are. Honestly I love the game. I know the age rating says 9+, but really I’d suggest 11+ maybe 10+. Like all video games, movies, and just games like D and D it really depends on what your kid is like, and how they behave. I don’t have a kid but when me and my dad were looking at reviews for d and d I realized, it really depends on how your kid acts. I totally think your kid should not get this game if there gonna get scared of demons and stuff, because there’s a decent amount of them in the game. There’s also a lot of disturbing stuff in the game like vodo dolls, flying eyes, and TONS of skeletons and zombies. It has easy controls that you can get used to very easily. I don’t really ever play or watch tv and video games, but this game is ADDICTIVE. If you don’t normally play video games and spend most of your time playing with your imagination outside, or fishing climbing trees etc, you got a good thing going so don’t mess it up with this game. Also if you’re a Christian like me, this game has many things that are Kinde of Anti-Christian. As long as your kid isn’t gonna go start some terraria cult, that believes in demons and slimes it’s a pretty good game. Overall it’s a great game as long as your kid knows it’s all fake and won’t be bothered by it. So I’m nearly about to go kill the wall of flesh I have all the OP accessories like the lightning boots and the lava waders and then sandstorm horseshoe balloon, anyway before I went to go kill the wall of flesh I was going to make a world with a lot of NPC’s so I went to work I made 5 houses 1 for the guide another for a merchant then a nurse, gun dealer, and demolisher. I made each one so then I decided to sell all of my junk in my main world. I switch between worlds pretty quickly and then it happens I get out of my main world where I put all my accessories and other good and op stuff but right as I got out it said File Misconception Error (then a bunch of numbers and dots) It had one button that said ok and I pressed that then I go into my selection of worlds and my Main World is GONE! So Terraria is stupid because it deletes 90% of my work without fixing anything, to be honest one thing that would be nice is if you could just give me a character named afcpandu with a star fury, molten hellstone armor no hard mode a meteor helmet as a vanity item , sandstorm horseshoe balloon, lightning boots, warding climbing claws, a warding magic carpet, and lava waders a nights edge then a bee gun an imp staff a adept fire flower a drax and a hellstone hamaxe and that’s it I can take it from there and if you do that I Will give this 5 stars because that would make my life so much better thank you for reading! It has been a pleasure to play your game, and I loved every single moment of it. From the first chopped tree to acquiring the Bone Key, the game has been full of surprises, biomes, music, NPCs, bosses, and rare items. I would like to thank you for this game, but would like for a few changes to be made. Firstly, I understand that the 1.3 update is very time consuming to make, but it would be truly fantastic. Currently, many mobile and console gamers feel inferior to those on the PC. The 1.3 update will change this, and give the versions even more popularity. Secondly, while adding the 1.3 update, would it be possible to keep the content that is unique to the mobile version? I mean small, but pleasant features such as the ability of a player to use all of their characters in a world, instead of linking them to one character, the ability to find a Drax in Shadow Chests, etc. Thirdly, I was wondering if, not just to mobile, but in general, there could be some additional bosses, biomes, and possibly some to occur after the Moon Lord is defeated. Again, thank you very much, and I hope that my requests can be fulfilled shortly. New update: So so so many bugs. I have my houses built together so they never go outside and die. Plus it's underground. The npc's will sometimes walk to a wall and basically spin really fast and it looks stupid. I want them to act like they're actually In their house and walk normally. Also when I tried taking my coins out of my piggy bank I had to make space in my inventory and move them there and then into my coin space. And also it doesn't auto filter the coins either. Other than that it's great to play, and also npc's take an eternity to spawn. So I've played Terraria across all platforms. And have done everything I wanted to do on both Pc and Xbox. I just have the Mobile version left. My only complaint is the fact that I can't hammer out the wooden beams. Is it just me or is it everyone's? I just can't do it though. And I built an awesome mahogany house while waiting to get ahold of dynasty wood. Same style too. Love it. I've started over in this game countless times because I enjoy it so much. Not because something screwed up but because this game is amazing. Nowadays when I get far enough I restart anyways. I highly HIGHLY recommend this game to people. Amazing Game. In my top 5 games of all time for sure. So this game is great I'm gonna that. There are also little things you can do if you want certain things that are just TOO HARD to have it dropped from! You can always create farms and stuff for a specific enemy to try and farm it until you get that item (I'm currently harvesting herplings for a nazar) and if you keep on going then you WILL eventually get it! No matter how low the drop rate is you can get it if you keep on trying! A funny little thing I found out is that you can change the time to get to a certain event like Easter (for Lepus) or Halloween (for the Pumpkin Moon) and so on. Another reminder is that if you don't want to live in a corrupt world you can always get the clentimenator then make new world for where you want to make a good house and not be disrupted by corruption or crimson and take out the unwanted biome in pre-hard mode before it can spread. You might've already known this but I thought I'd put up anyway. Also for the developers, if there's anyway to add more of the stuff from the pc mode onto mobile I will be grateful. Definitely worth the $5 it costs. Thank you, 505 games for making this game, for it is amazing. I only have one complaint, though. Every time I get on Terraria, there is a little ad that says "this build has expired, please update." I hate it when it says that, and my friends have this problem too. Please make an upgrade for Terraria and make the onyx blaster on IOS devices. Also make the Sky Fracture. I also would like it if you could make this amazing game to where you can have dyes on your accessories and make it to where you can hide your accessories. This would be awesome, because I am severely struggling to make my vanity set look absolutely amazing and to where I want it to be. Continuing, I would like it if you could make it to where you can’t see each person’s head on the screen because my friends always look through my stuff and always take my stuff. I am making a secret base so they can’t do that but it won’t work because they can see where I am. Thank you yet again for making this amazing game, and I hope you can fix these for me. Thanks! A bug that I found was that I can’t use beds. When I tap the bed it says “Your bed is obstructed” or something like that. Necromancer needs a nerf because at 98 defense he did 30 damage towards me and died 17 times in the dungeon. Fix the rainbow dye’s rainbow effect because the game will start to slow down the rainbow effect. When 1.3 is released you need to make the lunar bosses weaker because it’s a lot harder on tiny screens. The move pads are to big for the screen and take up a lot of room (including the IPad). More players should join local or online play because what good is it to just have 3 people!? Buff or debuff info needs to be added to know what each effect does. Chat should be fun on PC but why not Xbox and mobile? I have been wanting to talk to people instead of just giving messages with a character name. More inventory for all gaming consoles would make the game easier to have items. Coin gun glitches get me all the time, and what it does is that it turns the strength of platinum into copper/silver. A 1/200 chance of admin/unusable items should be obtained overtime from mechanical bosses. If re-logic sees this make sure I get notified. Thank you for taking the time out of your day to read this. What’s going on is that I have totally beaten terraria on mobile. There is nothing left to do; terraria is now unfun to me because of that. I have killed every boss, including the dungeon guardian and I have all the banners. To keep this version of this game alive you need to make new content. I understand that you are trying to perfect every little thing for our enjoyment, but it has been incredibly long. Mobile 1.3 was supposed to come out 2/4 quarter of 2017. Now it’s 1/4 quarter of 2018. I check the App Store every few our to see if 1.3 is out, and I get disappointed. I really hope that 1.3 comes out in a short period of time. I understood that no average Joe can make an amazing game like this, but every other console has 1.3 except mobile. I have mobile as my only platform. So, I get chills to check the App Store, but always get disappointed. Please update the 1.3 of terraria as soon as possible. I hope that 505games reads this and takes it into mind. Thank anyone who has read the very lengthy, five star review. I love this game to bits. It is a great game, especially for mobile. There are a few bugs here and there but they are too small to make a difference. I have been playing this game for a while now, like, a WHILE, and I only have one problem with the game; Nothing has really changed. The game needs more updates. Even if they are to add only 1 boss. I have beaten every boss many times and it gets kind of boring. All this game needs is a few more powerful items and a few more powerful bosses for those people who have been playing for years. Once you have beaten the game and done everything, which only takes about a year, it gets kind of boring. There is nothing new to it after you have built a nice house, beaten all of the bosses, gotten all of the NPCs, and acquired all of the rare/powerful weapons (North Pole, Flairon, etc.). If the developer adds only one update every month and only adding one new weapon or one new boss each time it would make the game so much better than it already is. But overall, great game. Definitely worth the 5 bucks. This game is very good. One of the best games I've played. There is a massive problem with it though. That is the updates. I mean ever since I've actually played the game I've only seen about 3 updates that really changed this games gameplay. 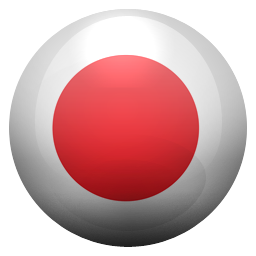 Not only that but the problem with the recording is still not fixed. As an addition to this update problem this game is basically going to update until almost the end of the year! You've got to be kidding. At first it was decided that mobile was going to get the update first and then the plan changes and the ones playing console are going to get the update first now. I mean seriously, why did this even happen why can't the mobile and the console both get released at the same time. I mean they are going to be just the same version so why go through the pain of releasing the mobile version of the 1.3 update at nearly the end of the year. This is a great game and hopefully this game could update quickly so that the players left out of the 1.3 update can get it and have fun just like those pc players that have terraria. Some weird things I found about this game! So, I personally love this game. I started way back in the first few months it was released, (I think). Back then, corruption was the scariest thing you've ever seen. So, I ventured forth into the corruption hoping to find wood (I was stupid, there is wood everywhere) and I stumbled upon a chest. I opened it and found the usual recall potions, copper bars, a few silver coins, but I don't know if this is a bug or an early game thing because I found a slime staff in there. My next weird thing is in my original iPad (I switched devices, and I still have the world and iPad) I was super pro and had my terra blade I worked hard for (the save and steal dupe method wasn't there back then). My world was messy, but it was useable. Suddenly, I was just looking for some chlorophyte when the game gave a notification about something "I forgot" and it logged me off terraria. I just thought I've been on for too long (a few hours) and they tried to kick me off so they can cool servers down or some thing. When I logged back on, I went to my jungle cave, but I found something else. ONE FOURTH OF MY WORLD WAS MISSING! This game is awesome, I love it, and, in my opinion, a lot better than Minecraft. 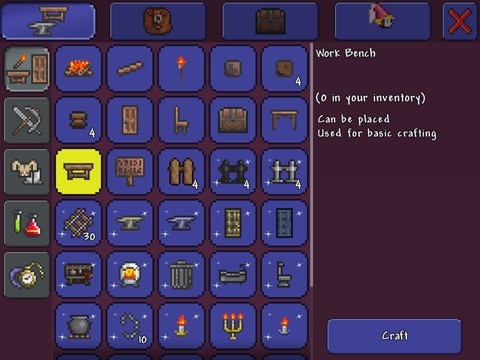 But a few things on some of the versions of Terraria, such as pc, are not attainable on the mobile version, such as normal, hard, and expert mode. I don’t know if you can fight the ludicrous mouse boss thing, and everything after that, because I haven’t ever gotten a truffle worm to battle, and possibly defeat, Duke Fishron. Please Include all of the items, settings, biomes, and, if they haven’t already been added, bosses. (About five minutes later) After looking through some of the other reviews, I found out that the ludicrous mouse is Martin mouse(I think, I’ve already forgotten), and the reviews also reminded me that there HASN’T been an update in a long time. A lot of ppl have said that they have everything, besides the unattainable things, but I’m still working on getting everything, so Terraria isn’t dead for me yet. But please actually update the game soon, and add all of the things that you can’t get on the mobile version that you can get on the pc. I’ve almost gotten everything, though. This game is most enjoyable, as there is much to do in the game. I would recommend it to others, as it has many bosses, many items, and it also has four main classes of character, without you having to just go onto a menu to pick one, with you being able to combine them and things like that, meaning that if you obtain all the melee items you can restart and try to obtain all the ranged items, summoning weapons, magic weapons, or combinations of them. The game, while not seeming like it would from first glance, has certain challenges such as obtaining the proper gear to defeat a boss in the game, trying to get NPCs to move in, and so on and so forth. 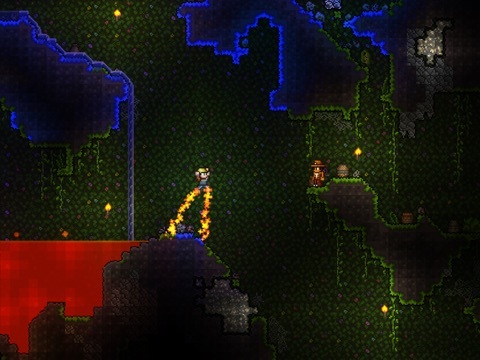 While I almost always find flaws in things, Terraria happens to be one of the few I cannot. The only thing I might be able to recommend is adding some of the PC only content to the mobile edition. If you have read this, thank you for doing so, and thank you, 505 Games, for creating this amazing game for everyone to play. Terraria was one of my favorite childhood games, and I love the fact it hasn’t had any major changes since I last played. It’s a fun 2d sandbox game, and the possibilities are pretty much endless. That is if you have the imagination for, of course. For multiplayer I would like it if you guys added a chat box. People could have the option to turn it on or off if they think the chat will be too toxic. I think it would be a good way to communicate instead of doing the simple sword swing, jumping, or taking the time to write out a message. My second recommendation is to make a kick option. I’ve always had that one guy who joins and just trolls everybody with land mines, and more. Even though I’m starting to play terraria less, I think these recommendations will make the multiplayer slightly better. I know I’m late, and I don’t mind if you guys take this review seriously, or even read it at all. 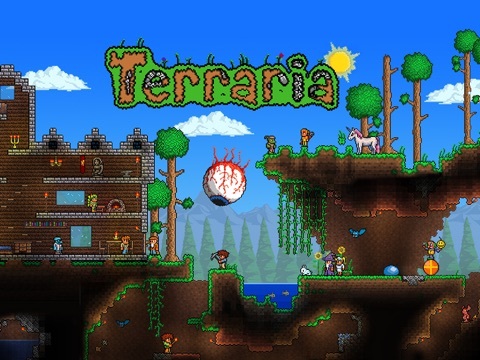 I understand you guys have a lot to deal with besides terraria, but I love the hard work you guys put into this game, and hope you continue it with others. I used to love this until I got everything and then I practically was indestructible. 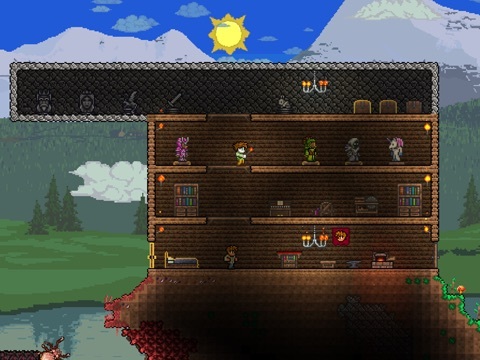 I built huge houses and had the vampire knives and legendary terra blade. I beat duke fishron a million times but still didn't get the stupid trophie that was super rare. Now I am just sitting here waiting for the moon lord update and until then I am not playing this game. There needs to be much more NPCs, mobs, and HARD bosses. Not the slime king or skeletron, real hard like duck fishorn(Lol) sorry duke fishron. All in all though, it's not a bad game, but I'm debating between this and clash royale. If there was more updates released on mobile I'd be playing 24/7. They keep giving all the new updates to computer and Xbox why not mobile the Mobil is like 3 months after computer and that's what just bugs me! Also when you go into your inventory when you can craft a TON of stuff, it lags so bad, I need more updates soon otherwise I'm trashing this game, I got everything on it, so I mean I totally recommend it to anyone who likes building and adventuring. Thanks for reading and plz plz update soon! I have had a great time with this game, so much that I have poured over 1,000 hours into it across the many versions that I have purchased. I can now say that I have the Amazon/Google and iOS ports, the 3DS port, the 360/PS3 port, Xbox One and PC ports, with the intention of getting the Nintendo Switch version when it releases. The only complaints I have about the mobile ports is that the day/night cycle doesn't lengthen to what they are in the PC/console/3DS port until hard mode and that the bosses also have half of the health that they do in PC/console/3DS. Considering I play mobile quite a bit when traveling, it doesn't prove to be a challenge until I get to hard mode. It takes me 2 hours to get to hard mode on mobile vs it takes me 4-6 hours on console, PC and 3DS. That length and difficulty is what I look for in a mobile game. And so far, I have only found difficulty in this game and Downwell when it comes to mobile. 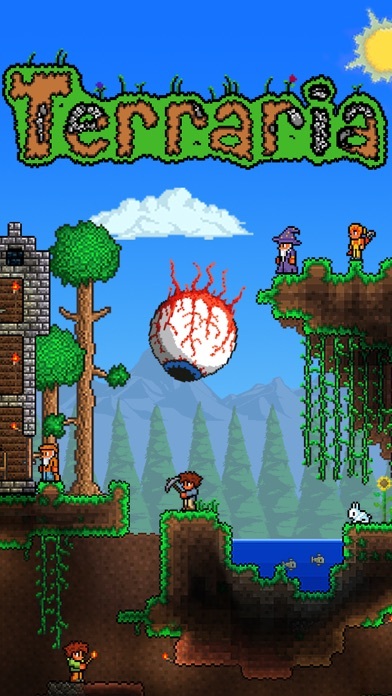 I’ve played the console and PC version of Terraria, and I like the mobile version too. I know that it is difficult to make mobile controls for a game designed to be played with a mouse and keyboard, but I feel the controls are a little difficult to use for people like me. I would just like to suggest controls options such as using an D-Pad with diagonal controls or a constantly displayed joystick with vertical and horizontal lines to prevent myself from always jumping or falling when walking. I’m not sure if controls enhancements were already planned with the new interface in the next update, but if not, I would really like to see them. I also find pressing and holding the screen for a second before building a little annoying, so maybe reduce how long you have to hold. I hope these suggestions helped on some future changes to enhance the controls system. Thank you for taking the time to read this review. Great game. We NEED 1.3!!! Terraria is one of the best games ever created, but please, add update 1.3, some more stuff to, and more items. I’ve maxed out really and the only boss I haven’t defeated is duke fishron. When I went back on to the game after deleting it, my cloud save stuff was there. I left my terrablade in my cloud save world, and used my cloud save character with only wings and a chainsaw to farm wood from a new world I made. I don’t know whether cloud save is supposed to save progress or not. If it didn’t, it wouldn’t matter because I could start over farming. Nbd. But it didn’t save the part where I left my terrablade and chain gun in the cloud world, though it did save my cloud character, so I was a character with wings, my armor, and my chainsaw. Nothing else. My other things had been lost. I don’t expect you to get it back, but please fix this. I’m sorry about the unpleasant length of this review, but it really is a problem and we all need 1.3 and cloud save fixed. Thank you, Andre. I enjoy playing Terraria when I get bored of playing Minecraft for a bit. There is more to explore and do. However there has not been an update for nearly a year now. And while these software updates keep coming out, it slowly adds bugs to the game. Now I am gonna answer certain things that Minecraft and Terraria users keep getting mad about. Crashes: Crashes may happen because of your device version. However the more you build on your world the more space it takes up. So for example, all these reviews saying they spent years on their world and now it keeps crashing, it is simply because they ran out of space. This can be fixed by deleting other apps. Hard Boss Fights: I can agree some of the bosses are very hard, but platforming skills and potions are key to winning. Before summoning a boss, I suggest making several platforms you can jump to. This helps make fighting certain parts of the boss alot easier if your melee is way more powerful then your ranged. More Items: I personally think Terraria (Pocket Edition) Doesn't need more items. 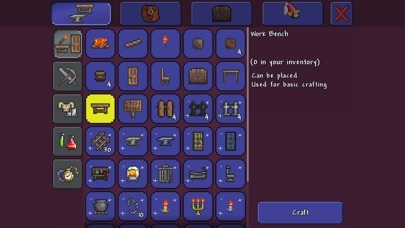 All the items in the game take up quite a bit of space if you crafted half of the items. There is a computer version of Terraria that has updates every season. So if you want more items. Go play the computer version. (It has way more items already, and more random structures!) That's it for the review. Overall this game gets a solid 9/10 from me. It just really needs an update. Thanks for reading! I must have been very lucky because I made an oceanic key mold farm and I got 2 Crimson key mold within 5 mins of sitting there😅. Also with this backup world thing I can get soooo much money!!! A little math for you: I have 25 rows of chests and each row has 15 chests in it. Each chest can hold 40 stacks of items. A stack of gold chests is worth 9 gold and 90 silver. Do the math:25x15x40x9.9=14,850 platinum I can make...I am rich beyond the game...I think I broke the game XD. Also I want the makers of the pc version to add an item used like and as rare as the BHS (broken hero sword) but for the different classes! I have a bone to pick with the devs!!! I have a range only challenge with range only world and character and the traveling merchant came and he sold the celestial magnet which I was looking for for 2 1/2 MONTHS! So I switch to my main character and go into the world and he is GONE!!! So devs can you either give me the 2 celestial magnets or at least make it so the TM doesn't despawn pls!?!? To all People who are Complaining. I love the game but really thought it would be fun to invite my friends to play or better yet join a mobile server. The mobile version of tererria has no online multiplayer and you have to download additional 3rd party apps for access to this. Other games on mobile have the opportunity to use online multiplayer like minecraft with servers and another game not as popular known as the blockheads allowing to make your own personal severs for free as well as joining friend via Game Center. No one judge me for this comment cause you all know I'm telling the truth about the issue and later on other people are gonna ask for it not just me. Everyone without the PC or Console edition look this up and support this comment if you want wider multiplayer on your wish list. There is a reason why we can write reviews people. This game is really starting to get boring follow my advice or otherwise this game is dead on mobile. No one will play after doing so for at the very most a year by which they probably would have quit already that means less business for you guys at 505 games and more of us turning to your competitors for paying up. First of all thanks for reading this review. This is a really good game one of the best ones in the Appstore in my opinion. But I’ve pretty much played all that there is in it already I’ve beaten every boss before (up to the duke) and gotten almost very item although the game devs may be trying too take there time with it it needs an update if you look at the app history it’s been a long time since an update. I’ll continue to play this game but it needs 1.3 in it. Fore those of you who may not now this 1.3 adds in a hole new roster of bosses (moonlord,celestial pillars and lunatic cultist) and more weapons and enemies it really needs it. both pc and console already have this update and mobile users are being left in the dust. We may not be the devs first concerns but we need an update. as of the time I’m writing this mobile is still in 1.2 . Thank you for all who have read through this boring rant. You have inspired me and my brother to work together! We have defeated the brain eye skeletron. We are still working on the wall of flesh! But with our team work we can do it! Thank you very much me and my brother love this game we have worked together a lot! We also got the bee gun by killing the queen bee! I found my old world L I found all my things I left behind. We trade a lot! We scream when we fall. Or when anything spooky is happening. I love that you have cloud save I found all my old pets in the glass cages. This is a awesome game and I hope it stays that way! So keep up the amazing work. I love that you can play with each other my brother always plays this game! Me and my brother are loving this game! My name for the game is Luna. I named a world after horses me and my brother rode there names are LJ and Barny. We have trued and tried to kill the wall of flesh we will try again and again and never give up! I have a love/hate relationship with the current update. I love the bigger worlds (it's about time! ), but as many others have mentioned, it has a tendency to crash, to freeze if you get a text or something, and cloud saves can randomly disappear. Crashing is annoying, though I've gotten used to saving frequently. The freezing can be quickly remedied by hitting the home button and immediately reopening terraria. The disappearing cloud save worlds is my biggest issue. So far, it's happened to me twice, though both times my world reappeared after about 10-15 minutes (I powered off and back on, and closed out of terraria, both times--not sure if that affected anything or not). So, while I technically haven't lost anything, I'm becoming paranoid that I will, since apparently there's no reliable way to save a backup of cloud saved worlds so they can't randomly be lost. I might just stop playing for awhile until these glitches are fixed. *Update 9/12 Making it possible to save backups of worlds was awesome, so I started playing again. However, Terraria randomly reset itself and I lost all my local data; luckily my cloud saved older copy was okay. Since then, though, my cloud save worlds disappear as soon as I close the app. So, if my local data disappears again, I will have nothing. So, I'm back to not playing for awhile. Sigh. I love this game, but the platform on iOS has been having pretty consistent issues for the past few updates. 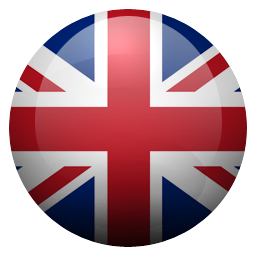 A Great Game...But, Are We Updating This Thing Or Not? iCloud save progress not working. A great game when working but for two years now I’ve had a problem where I will try saving progress via iCloud and it don’t save. I.e. I will plant seeds and come back and they’ll be out of the ground and back in my inventory. I will build homes and come back and some will be gone but the materials will be back in my inventory. Get new armor and come back and I’ll be reverted back progress yet again. I contacted 505 Games Support and they have basically said for two years oh it’s a bug there’s nothing we can do contact Pipeworks or Re-Logic. I do that and don’t hear back from them. This bug has been known about for two years that I know of and still not fixed? That’s not very professional of a company to do that to their fans. I love this game when I’m able to save, I play non stop for hours, but when you leave and come back and your progress isn’t saved that’s beyond frustrating. I hope one day they can get their act together and fix the bugs they’ve been saying is being worked on for the last two years. Here is why this game got a 5/5. I give it a 5/5 because it is an amazing game. I mean sure the graphics are blocky but thats what makes this game fun, the simplicity of its graphics and yet the complexity of its many crafting recipes. The only thing is i cant load to my original world because it would load like a third of the way and then crash. I think this is because i have to many boss summoning items but can anyone help me on this? Anyways this game is worth however much money it costs no matter the price. Also note that this is a review of an Terraria veteran, i have been playing this since the beginning of last year but i have lots of endgame things. All of these things are obtained legitimately of course. But I digress i still play this even when i have endgame stuff why? Well because of how fun it is. No matter how good your items are there always is something better. Hey, this game is great. You got me hung! BUT, I think we should have more NPCs. Because there isn’t really that much if you think about it. Like another guide, in a way. What he does is give missions for you to do. Another thing the robot could sale you is a cloner. It’s a tiny robot that follows you, like a pet. BUT, clones you during battles, mining, whatever. Don’t worry though, it would only last a while. Then the robot recharges. And add a few of your own. Remember, this isn’t a complaint, it’s ideas. Some other things is that there IS a few glitches. Like the slime gun. It point the opposite direction. So try and look into those. Back to those NPCS. Could you add the computer only things, like, the barkeep. I think it’s a big part of the game. But it isn’t there! Neither is the tax collector. 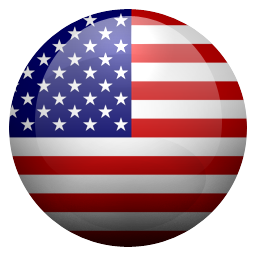 Add the house interference! So, all I want is bug fixes, and things off of the computer. Thanks! Had played about a year ago and had loads of fun playing it. Eventually I deleted it because I had done everything in the current iOS version. I just downloaded it again and after looking at the version in the App Store it says it hasn’t been updated in more than a year. When I deleted the game they had just implemented an update that was very buggy and had some issues I was sure would be fixed soon. From what I can tell they don’t do any regular bug fixes or any maintenance to keep the game enjoyable or nevertheless playable. This game constantly crashes and if your doing anything within a minute or two of the crash your progress may dissapear. I would give it five stars but they obviously don’t care about the condition of the game. *Update 1 week later. I cannot stand this game anymore. I now notice saved games can disappear after any crash(CRASHES ARE EXTREMELY COMMON AND HAPPEN REGULARLY) and I’m deleting this game again. I can’t start over on a game that can’t keep a save or even be played. YOU NEED TO DO 1.3 UPDATE IVE BEEN WAITING FOR A YEAR!!! But seriously, please, I’m really bored. Also after the moon lord you should do a boss that is something like “the spirit of the true Cthulhu” that is the size of all the easy mode Cthulhu bosses combined. This would be a very big boss update and could be very cool. Not only would it be a very cool end game boss it might be able to summon the Cthulhu bosses and remind the characters of when they first joined. <This would give your game a lot of attention.> (also, if you do take my idea you should do something interesting with it that makes people want to get the game and beat it and keep playing) I’m looking forward to what loot it might drop. Also there are some bosses people fight that are not in normal terraria. If these are bosses you think about adding but didn’t because they were too hard you could use my boss to put them in. Again your game will get more ATTENTION.